AP Badi Bata Programme, Badi Pilustondi Programme, Making Arrangements for Inauguration Programme: Conduct of “Badipilustondi” Programme for the year 2016-17 from 15th June to 21st June, 2016 - conducting programmes and activities - Instructions issued - Reg. All the Regional Joint Directors and the DEOs in the State are informed that a massive programme “Badipilustondi” is planned as a special drive to create awareness among people that education is the right of every child and each one of them should complete the elementary education cycle. 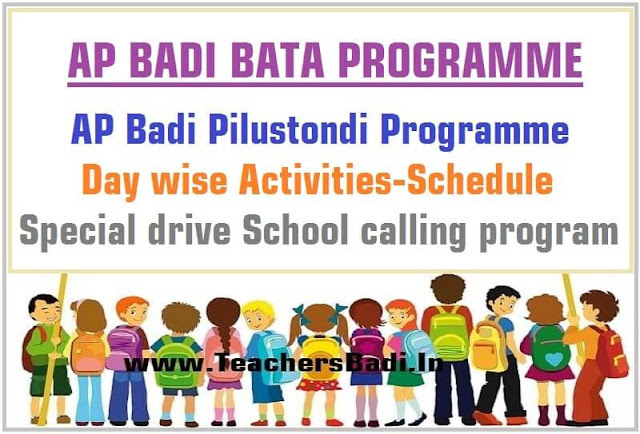 The objectives of the Badi Pilustondi Programme shall be achieved through community participation, parents’ involvement, effective teacher participation and also regular monitoring by the education department. The Badi Pilustundi Programme is scheduled from 15th June to 21st June 2015 across the State. The Hon’ble Chief Minister will inaugurate the Badi Pilustundi programme from Vizianagaram district on 15.06.20151. In your district various programmes and activities relating to Badi Pilustundi programme may be undertaken under the leadership of the District Committee. The RJDSEs/DEOs are, therefore, requested for personally monitoring the BadiPilustondi programme and taking steps, requisite, for absolute participation of all the field functionaries in this massive programme making it a grand success. They are further requested to report the day to day achievements of the programme to the Commissioner without fail. A copy of the action plan and day wise schedule of the Badi Pilustondi programme is appended with these proceedings for ready reference. The “Badipilustondi” programme is the clarion call of Government of Andhra Pradesh to create awareness among people that education is the right of every child and each one of them should complete the elementary education cycle. The objectives of the Badi Pilustondi programme can be achieved through community participation, parents/teachers’ participation and also regular monitoring. The BadiPilustondi programme is scheduled from 15th June to 21st June 2016 with day-wise activities. I therefore request you to cause action to be taken to make all arrangement for the Hon’ble Chief Minister’s Programm. Please ensure participation of students, community members and public representatives and make it a grand success.